US Industrial production peaked in July and is more or less at April 2006 levels. Industrial production has grown by an average of less than 0.4% p.a. since the middle of 2000. Manufacturing peaked in February…machinery production peaked in June…motor vehicles and parts which led the November rise, peaked in July….aerospace peaked in July…durable goods peaked in July…non durable goods production peaked in February…business equipment production peaked in July. Also continued weakness and weakening in Eurozone manufacturing PMIs (flash estimates), especially Germany. 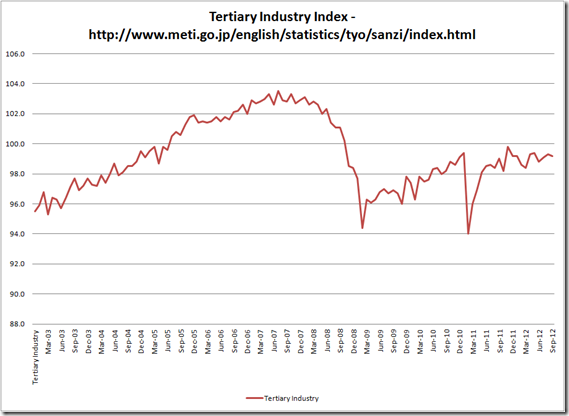 Japan looks to have entered its third recession in the last few years (a triple dip). I say may have, because two quarters of negative GDP growth is only a crude way of defining a recession and not the formal way of defining a recession in Japan. The current third leg has been led by a rather hefty decline in exports, the fourth largest such decline since at least 1994 – all of these four declines have occurred in the last four years. Service sector activity in October declined from September levels, but is most notably still below January 2005 levels. 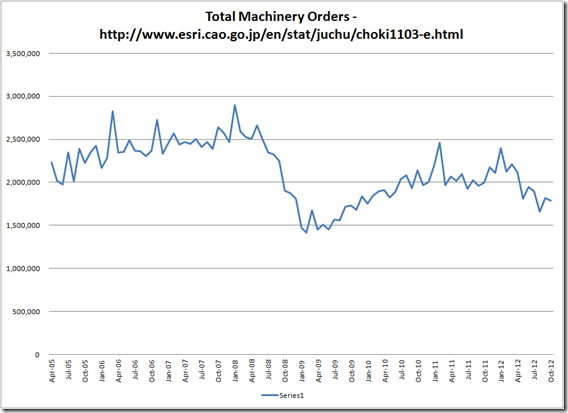 Recent data on October machinery orders was also weak, but the longer term picture is worse. This entry was posted in Asia, Economics, Euro Zone, US Economic by Depthdynamics. Bookmark the permalink.